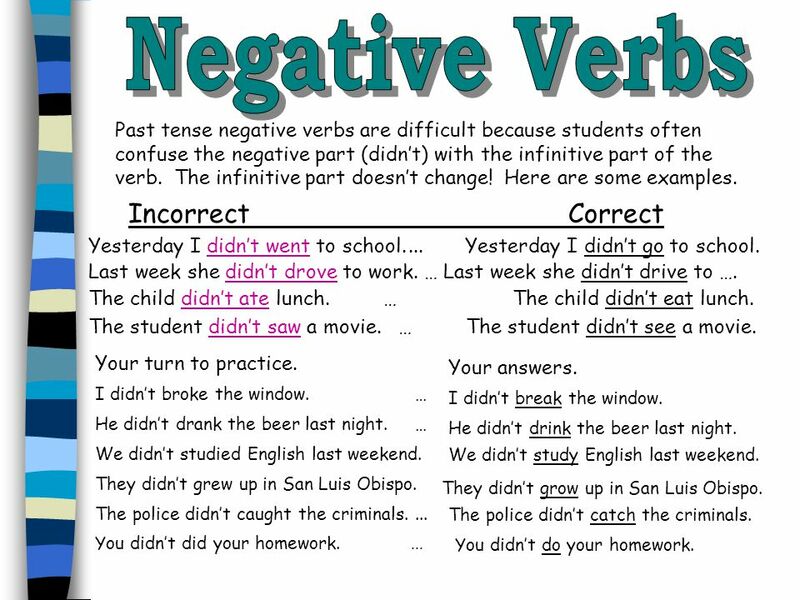 Past tense negative verbs are difficult because students often confuse the negative part (didn’t) with the infinitive part of the verb. The infinitive part doesn’t change! Here are some examples. Incorrect	Correct Yesterday I didn’t went to school Yesterday I didn’t go to school. Last week she didn’t drove to work. … Last week she didn’t drive to …. The child didn’t ate lunch … The child didn’t eat lunch. The student didn’t saw a movie. … The student didn’t see a movie. Your turn to practice. I didn’t broke the window. … He didn’t drank the beer last night. 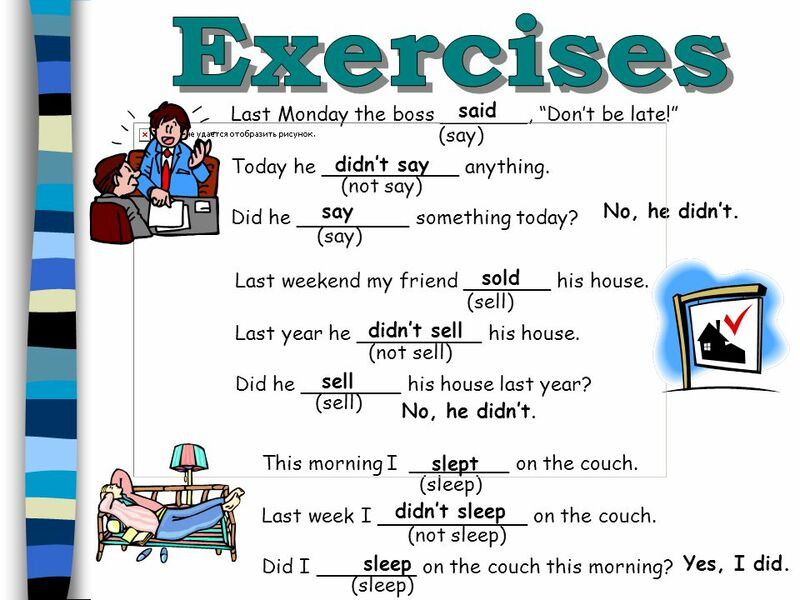 … We didn’t studied English last weekend. They didn’t grew up in San Luis Obispo. The police didn’t caught the criminals. ... You didn’t did your homework Your answers. I didn’t break the window. He didn’t drink the beer last night. We didn’t study English last weekend. They didn’t grow up in San Luis Obispo. The police didn’t catch the criminals. You didn’t do your homework. Last week she ____________ a soda. (not drink) Did she _________ a soda yesterday? didn’t drink drink Yes, she did This morning he ________ to work. (drive) Yesterday he ____________ to work. (not drive) Did he _________ to work yesterday? drove didn’t drive drive No, he didn’t Last month he ________ a letter. (write) Last night he ___________ a letter. (not write) Did he _________ a letter last month? 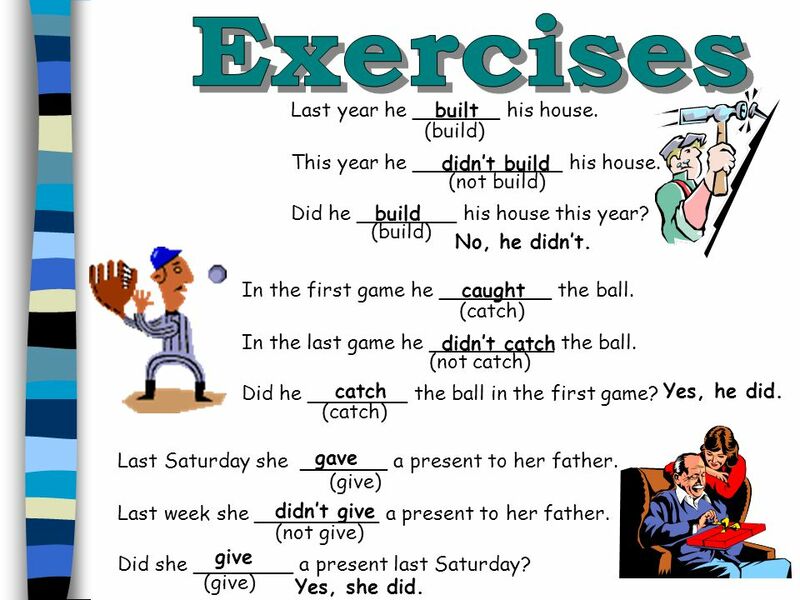 wrote didn’t write write Yes, he did. 7 Exercises thought This morning he ________ about his girlfriend. (think) Last week he ____________ about his girlfriend. (not think) Did he _________ about his girlfriend this morning? didn’t think think Yes, he did. Last night he _________ and played the piano. (sing) Last weekend he ____________. (not sing) Did he _________ last night? sang didn’t sing sing Yes, he did. fought Last Saturday he ________ Mike Tyson. 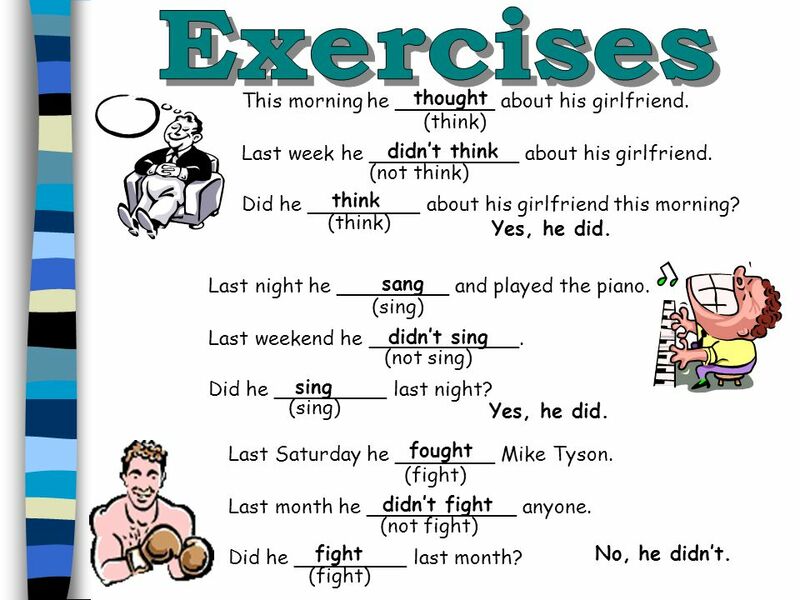 (fight) Last month he ____________ anyone. (not fight) Did he _________ last month? didn’t fight fight No, he didn’t. Last week she __________. She lost her race. (not win) Did she ________ last week? won didn’t win win No, she didn’t. This morning they ________ in the park. (sit) Last weekend they ____________ in the park. (not sit) Did they _________ in the park last weekend? sat didn’t sit sit No, they didn’t. 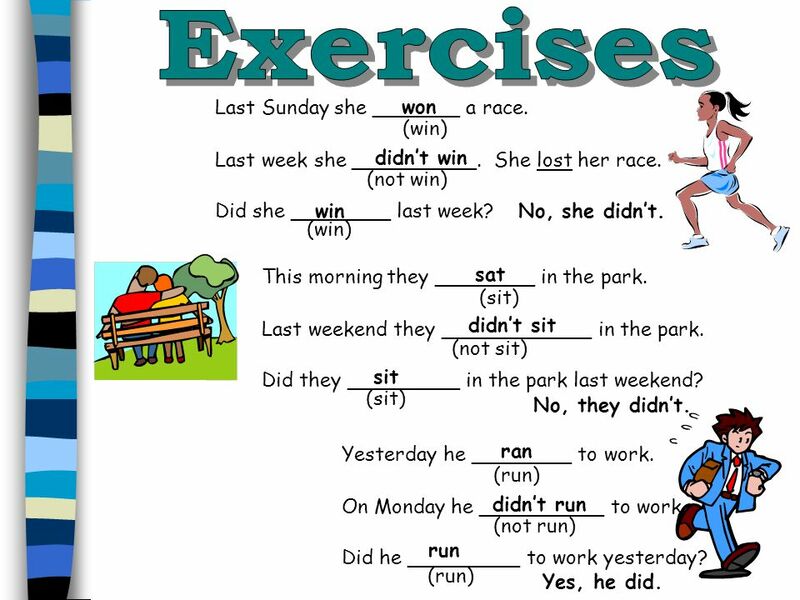 ran Yesterday he ________ to work. (run) On Monday he __________ to work. (not run) Did he _________ to work yesterday? didn’t run run Yes, he did. 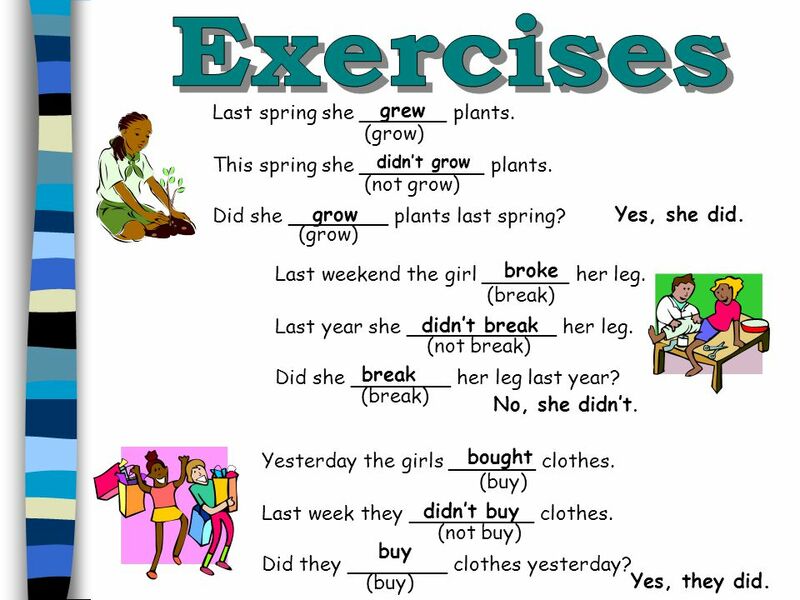 This spring she __________ plants. (not grow) Did she ________ plants last spring? grew didn’t grow grow Yes, she did. broke Last weekend the girl _______ her leg. (break) Last year she ____________ her leg. (not break) Did she ________ her leg last year? didn’t break break No, she didn’t. bought Yesterday the girls _______ clothes. (buy) Last week they __________ clothes. (not buy) Did they ________ clothes yesterday? didn’t buy buy Yes, they did. Last night he __________ dinner. (not bring) Did he ________ dinner last Monday? didn’t bring bring Yes, he did. flew This winter the birds ________ south. (fly) Last summer they ____________ south. (not fly) Did they _________ south this winter? didn’t fly fly Yes, they did. Yesterday she ________ in the office. (fall) Today she __________. 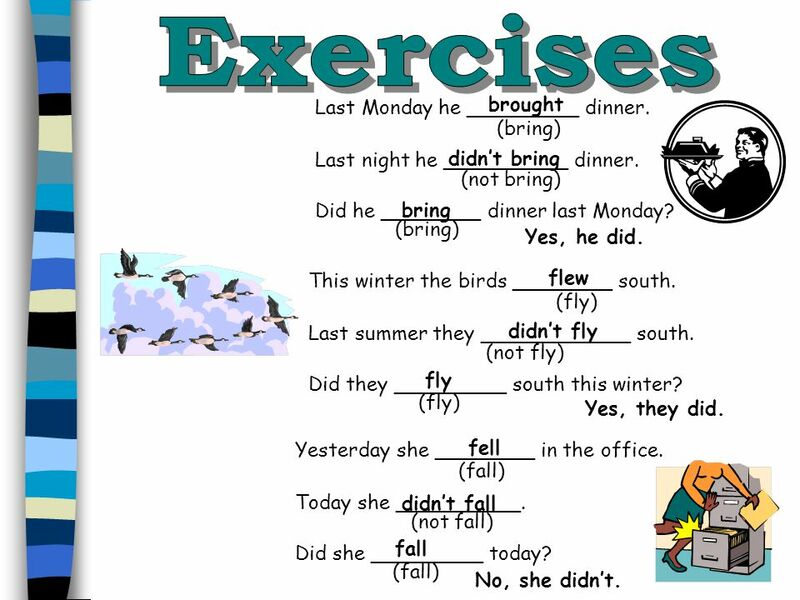 (not fall) Did she _________ today? fell didn’t fall fall No, she didn’t. Today he __________ to his boss. (not speak) Did he ________ to his boss today? didn’t speak speak No, he didn’t. saw Last weekend they _______ a movie. (see) Last night they __________ a movie. (not see) Did they ________ a movie last night? didn’t see see No, they didn’t. Last Saturday he _______ a bicycle. 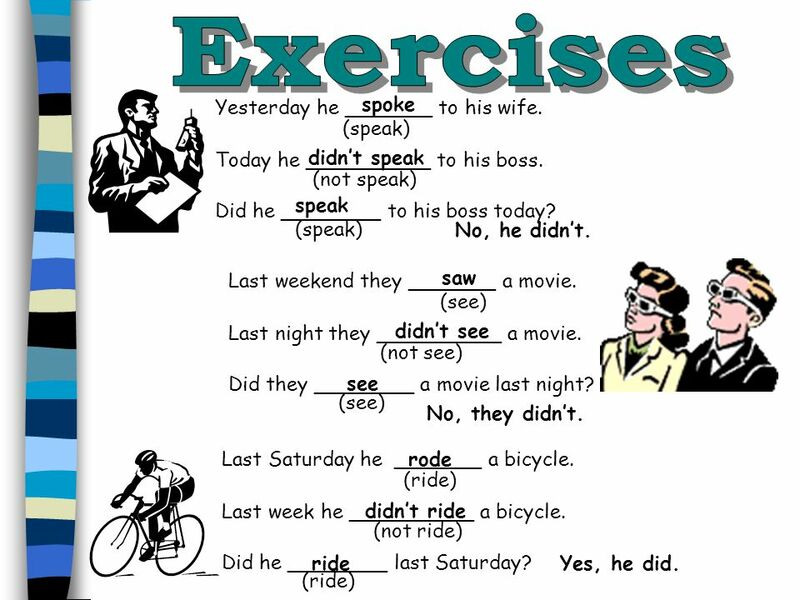 (ride) Last week he __________ a bicycle. (not ride) Did he ________ last Saturday? rode didn’t ride ride	Yes, he did. This year he ____________ his house. (not build) Did he ________ his house this year? built didn’t build build No, he didn’t. In the first game he _________ the ball. (catch) In the last game he __________ the ball. (not catch) Did he ________ the ball in the first game? caught didn’t catch catch	Yes, he did. gave Last Saturday she _______ a present to her father. (give) Last week she __________ a present to her father. (not give) Did she ________ a present last Saturday? didn’t give give Yes, she did. Today they ___________ the race. (not begin) Did they _________ the race today? began didn’t begin begin No, they didn’t. Last weekend my friend _______ to my house. (come) Last night he __________ over. (not come) Did he ________ over last night? came didn’t come come No, he didn’t. This morning I ________ my clock radio. (hear) Last week I ____________ my clock radio. (not hear) Did I ________ my radio this morning? heard didn’t hear hear Yes, I did. 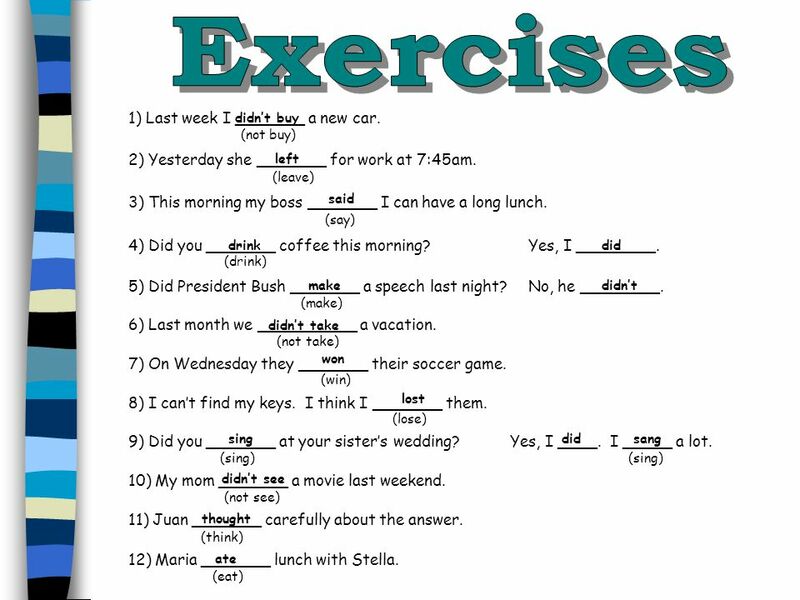 14 Exercises knew Last week they _______ the answer to their homework. (know) This week they ____________ the answer. (not know) Did they ________ the answer this week? didn’t know know No, they didn’t. made Last birthday she _________ a cake. (make) This Christmas she __________ a cake. (not make) Did she ________ a cake last birthday? didn’t make make Yes, she did. Last Saturday he _______ his bills. (pay) Last month he __________ his bills. (not pay) Did he ________ his bills last Saturday? paid didn’t pay pay Yes, he did. Today he ___________ anything. (not say) Did he _________ something today? didn’t say say No, he didn’t. sold Last weekend my friend _______ his house. (sell) Last year he __________ his house. (not sell) Did he ________ his house last year? didn’t sell sell No, he didn’t. This morning I ________ on the couch. (sleep) Last week I ____________ on the couch. (not sleep) Did I ________ on the couch this morning? slept didn’t sleep sleep Yes, I did. 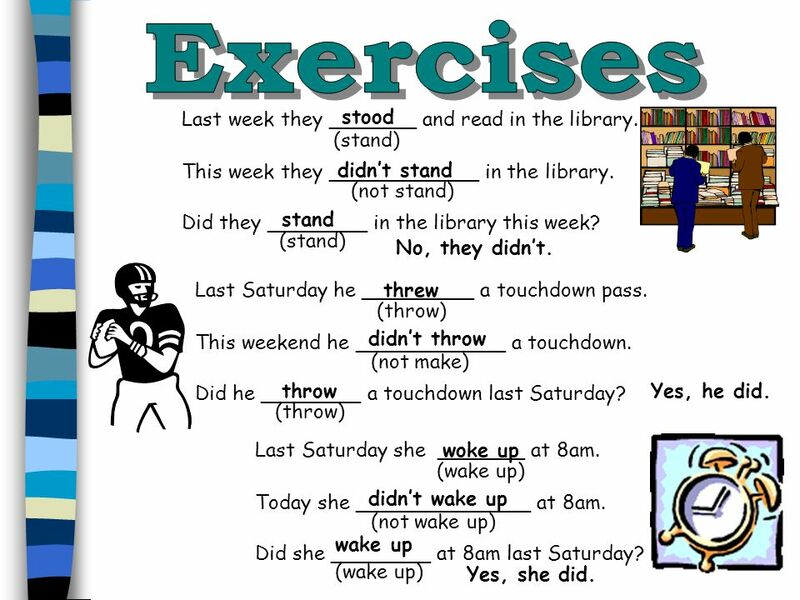 16 Exercises stood Last week they _______ and read in the library. (stand) This week they ____________ in the library. (not stand) Did they ________ in the library this week? stood didn’t stand stand No, they didn’t. Last Saturday he _________ a touchdown pass. (throw) This weekend he ____________ a touchdown. (not make) Did he ________ a touchdown last Saturday? threw didn’t throw throw Yes, he did. Last Saturday she _______ at 8am. (wake up) Today she ______________ at 8am. (not wake up) Did she ________ at 8am last Saturday? woke up didn’t wake up wake up Yes, she did. Today he ___________ one. 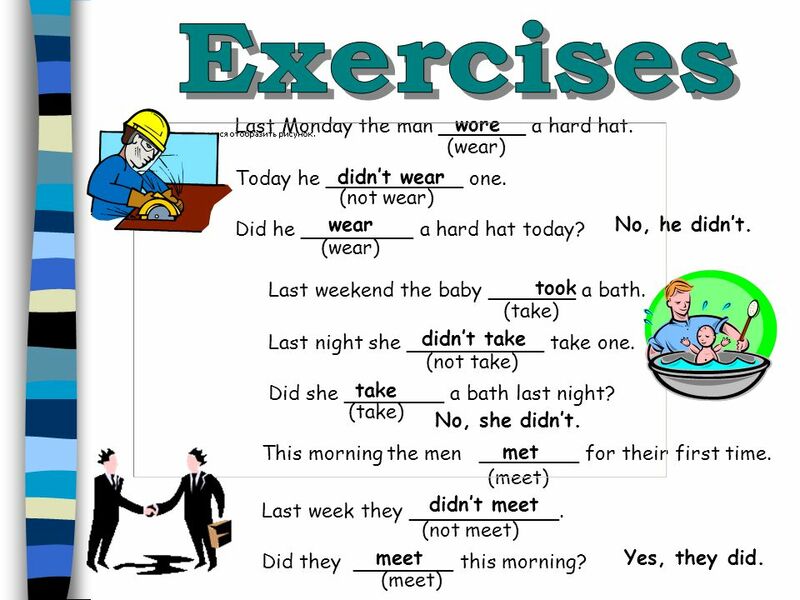 (not wear) Did he _________ a hard hat today? wore didn’t wear wear No, he didn’t. Last weekend the baby _______ a bath. (take) Last night she ___________ take one. (not take) Did she ________ a bath last night? took didn’t take take No, she didn’t. met This morning the men ________ for their first time. (meet) Last week they ____________. (not meet) Did they ________ this morning? didn’t meet meet Yes, they did. 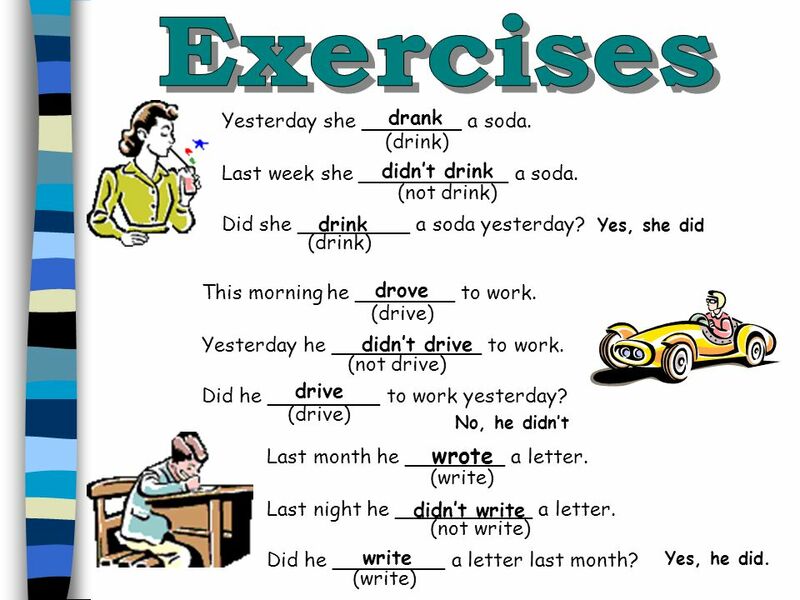 18 Exercises 1) Last week I _______ a new car. 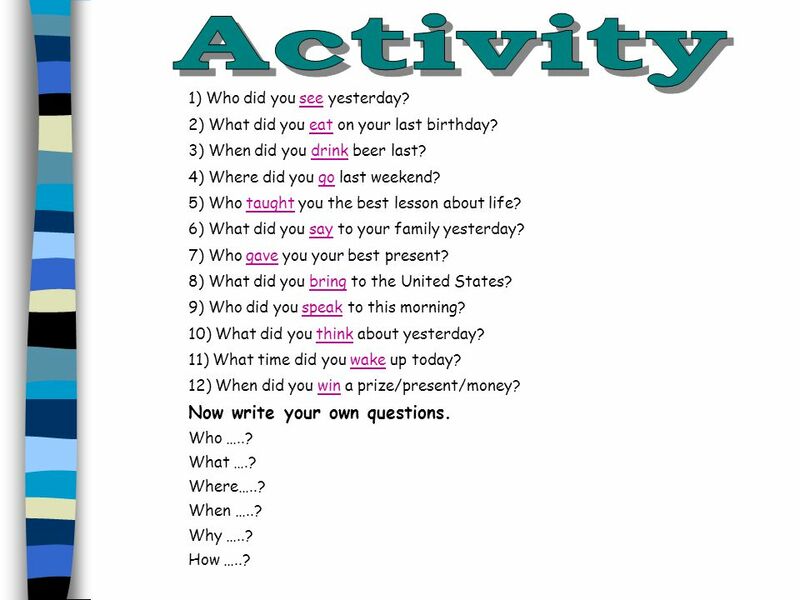 19 Activity Now write your own questions. 1) Who did you see yesterday? 2) What did you eat on your last birthday? 3) When did you drink beer last? 4) Where did you go last weekend? 5) Who taught you the best lesson about life? 6) What did you say to your family yesterday? 7) Who gave you your best present? 8) What did you bring to the United States? 9) Who did you speak to this morning? 10) What did you think about yesterday? 11) What time did you wake up today? 12) When did you win a prize/present/money? Now write your own questions. Who …..? What ….? Where…..? When …..? Why …..? How …..? 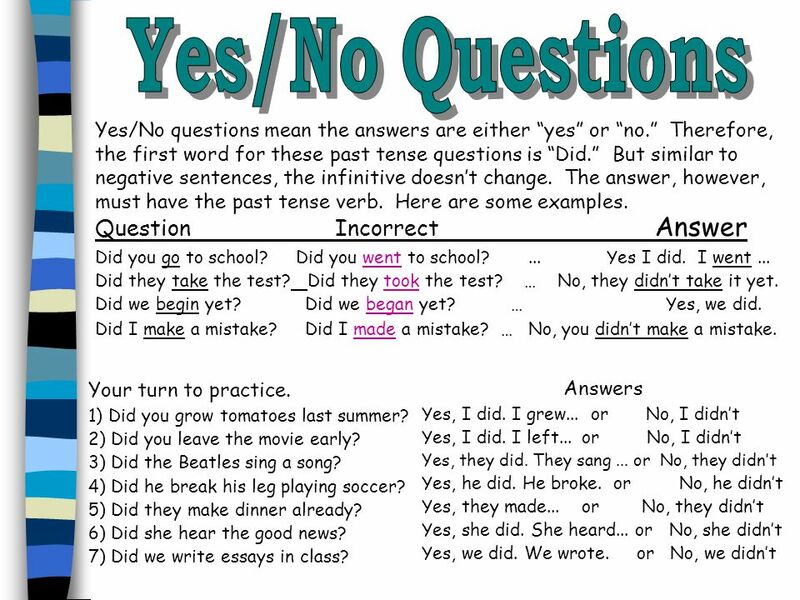 Download ppt "Past Tense Verbs Irregular Negative Yes/No Questions." 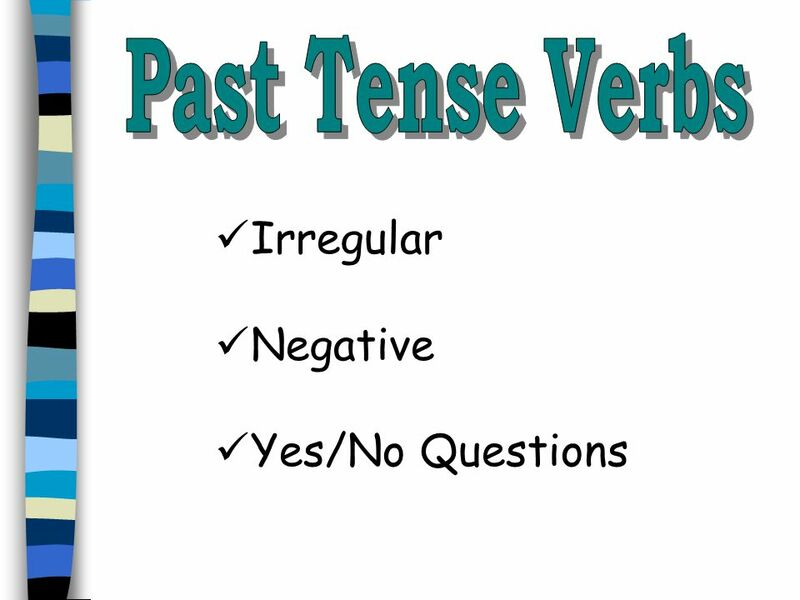 Language The simple past tense. Question, Negative, and Affirmative Practice. Directions: Work with a classmate. 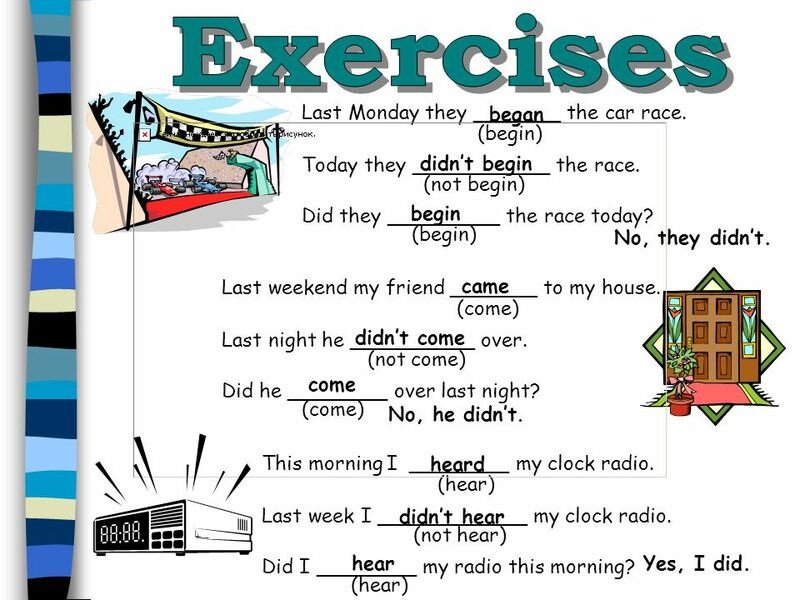 Look at the main verb and adverb (time word or phrase) at the top of. 1 bring brought. 2 Vb Vp be was/ were bring brought come came become became drivedrove arisearose begin began wear wore. Healthy 2nd semester Unit 10. enjoy 2nd semester Unit 10. 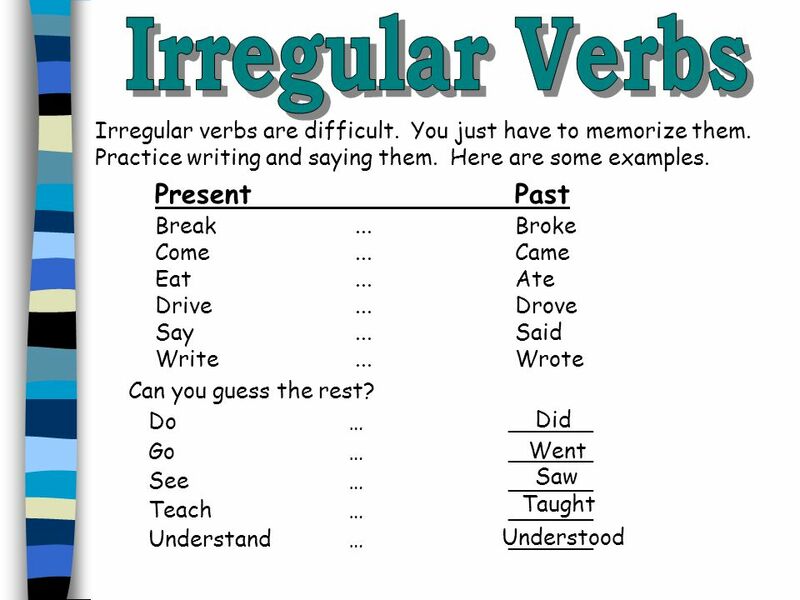 40 RfE IIUnit 12Verbs: Irregular past. 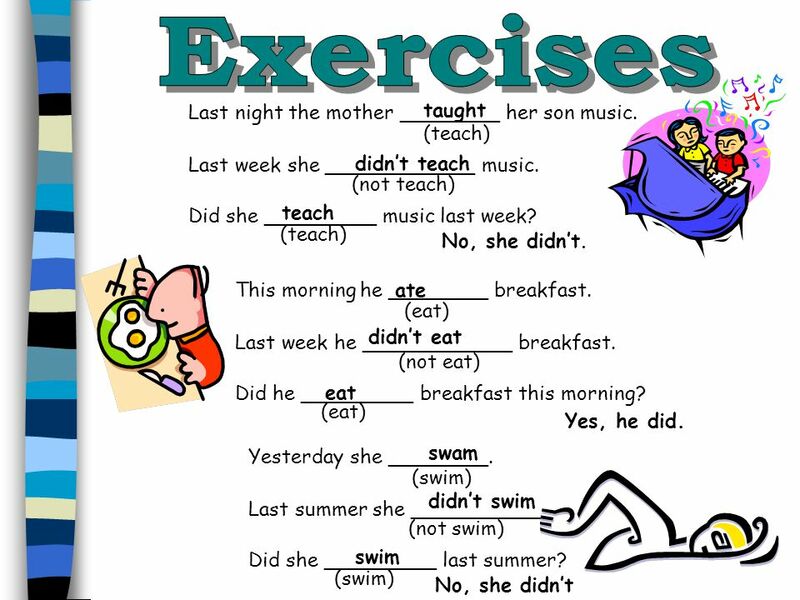 she … RfE IIUnit 12Verbs: Irregular past to be to become to begin to break to bring she was she became she began. 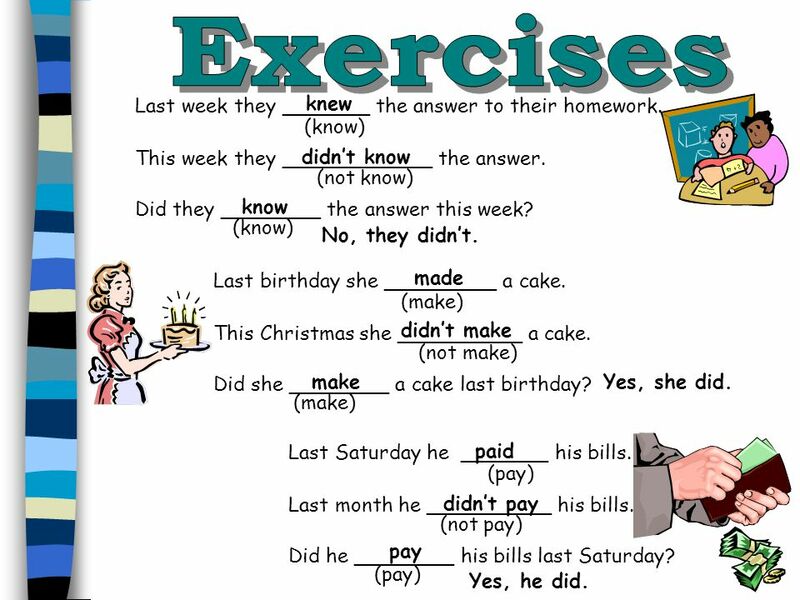 SIMPLE PAST TENSE GIMNASIO LOS PINOS ENGLISH CLASS. Were you young someday, grandpa ? Look little rascal, as you see yourself, I saw myself, as you see me, you’ll see yourself. I wish you live as long as. Irregular Verbs Roberta Grandi – Università della Valle d’Aosta. Be. be was/were beat beat beat become become became.